Background: Global aquaculture production has increased continuously over the last five decades, and particularly in China. Its aquaculture has become the fastest growing and most efficient agri-sector, with production accounting for more than 70% of the world’s aquaculture output. In the new century, with serious challenges regarding population, resources and the environment, China has been working to develop high-quality, effective, healthy, and sustainable blue agriculture through the application of modern biotechnology. Sound knowledge related to the biology and ecology of aquatic organisms has laid a solid foundation and provided the innovation and technology for rapid development of the aquaculture industry. 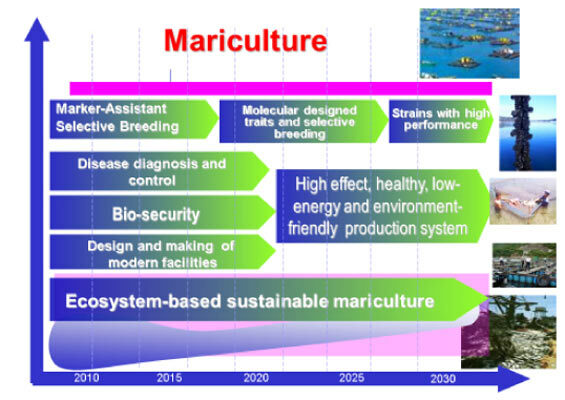 Marine biotechnology, which is enabling solutions for ocean productivity and sustainability, has been promoted since the last decades of the 20th Century in China. Objective: In this article, priority areas of research, mainly genetic breeding, omics studies, novel production systems, biosecurity, bioprocesses and biorefinery, as well as the major progress of marine biotechnology R&D in China are reviewed. Conclusion: Current innovative achievements in China are not enough and the level and frequency of academic advancements must be improved. International cooperation and assistance remain crucial for the success of marine biotechnology. Aquaculture, Marine biotechnology, Genetic breeding, Omics study, Novel production systems, Biosecurity, Bioprocesses and biorefinery, China.